This may be the first page you have jumped to on my website, but for me it marks the end of a long journey. When I first thought about bringing this creation to the internet, it was because I was fed-up with the daily aches and pains I suffered and I found out it was due to my mattress. From there, the whole project grew and now you will find reviews on the best mattresses, pillows and comforters I have come across. However, I also know that everyone loves a bit of ambience in their bedroom, so that’s why I decided to add a selection of the very best coverlet and comforter sets I’ve come across. 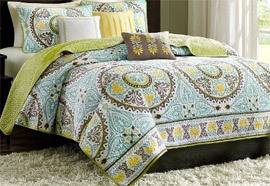 So, here are the coverlets and comforter sets I really like. Hopefully some of you will share my taste! I chose this comforter set from Cozy Beddings as my overall best for quite a few reasons. One is price, which really surprised me. The other was aesthetics. For me, there is nothing better than a well coordinated bedroom and since the bed is the centre piece, I always make it my focal point. With this set you get no less than 10 different colors so I figured there had to be one that would catch your eye. Aesthetics aside, you probably want to know what’s included with the price. Well, it’s a 3-piece so you get a Borrego Sherpa/Berber throw blanket, a down alternative comforter and 2 pillow shams. Both the down alternative comforter and the blanket have an antimicrobial finish which helps to repel dust mites and other allergens. Comfort is something else that’s important and Cozy Beddings have done a fine job with this; the comforter is reversible with super micro-fiber polyester to one side and the Sherpa/Berber to the other. Oh, and you can also buy this set in three sizes: Twin, Queen or King. Not only is this comforter set fantastic value for money (because you get so many pieces included), if you like soft colors that will bring a sense of warmth to your bedroom, this Provence Embroidered set from KingLinen is definitely worth considering. What you get is a complete set that has beautiful floral patterns in purple and white on a gray background. The pattern is bold so it doesn’t look over fussy, and the colors are delicate on the eye. The comforter filling is 100% polyester and can be machine washed AND will go in the tumble dryer. Personally, if you want to let out your inner designer this comforter set will allow you to do just that! Oh, and it comes in both Queen and King sizes. The mere name Madison Park Quebec Coverlet screams luxury, and this mini set certainly won’t disappoint. You should also be sitting down when you see the price and not in a bad way. 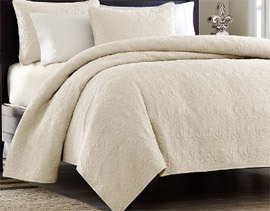 If you like neutral colors, or even if you like strong colors in your bedroom and need something that will help tone things down a bit, this coverlet set will do the job very nicely. It comes in an Ivory Pre-Wash finish with an understated embroidered pattern. The pattern is also extended to the 2 included pillow shams. The material it’s made from might not excite you because its polyester, however the overall feel is one of softness, and I think this will serve very well as an alternative to your comforter during the summer months, or even as an additional layer during winter. Whatever you choose to use it for, this coverlet set will give your bedroom that added touch of class you’ve been looking for. It also doesn’t matter if you have a King or Full/Queen bed because both sizes are available. I’m going to stick with the Madison Park range for my overall best coverlet set because, well, I think they offer some great products in their line that look way more expensive than they are. 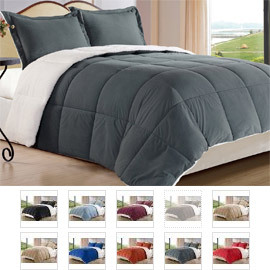 You get one coverlet, which isn’t that thick you couldn’t use it through the summer months as an alternative to your comforter, 2 pillow shams and 3 pillows, making this one of the best priced 6 piece coverlet sets I have come across. The color is described as print however it has a very Indonesian “flavor” hence the name Samara. You can expect colors like green, taupe, teal, brown and yellow that are all blended together perfectly in the overall design. The pillows are decorated in the same design but again, Madison Park has shown their eye for detail because they also have pleats and beading to finish off the whole look. Both the coverlet and the pillow shams are made from brushed polyester so that feeling of softness is not lost with this set either. If you’re looking for top quality without the price tag, I really do recommend you at least take a look at this coverlet set.